A wide range of eminent activists and thinkers respond to the question: What non-military alternatives do you see to the conflict in Syria? With the Obama administration forcefully making its case for the necessity of military intervention in Syria in recent weeks, the United States has found itself once again on the brink of yet another war in a predominantly Muslim country. The administration’s plans for war have been repeatedly stalled, first by the British parliament, then by the U.S. Congress’ assertion that it vote on the matter, and finally by Assad agreeing to turn over his chemical weapons. In large part, public opinion and protests around the world drove these non-military developments. But, with the Obama administration clear that strikes are still on the table, many are still wondering what more can be done to bring the bloody conflict in Syria, which had taken more than 100,000 lives before the use of chemical weapons in August, to a speedy end. To respond to the clear need for nonviolent options, Waging Nonviolence asked a wide range of eminent activists and thinkers: What non-military actions could help resolve the conflict in Syria, either from the perspective of the United States or the Syrian people? Here are more than a half-dozen proposals for how diplomacy, organizing and nonviolent alternatives could be used to facilitate an end to the crisis. The United States (maybe with Russia) can call for a meeting of the signers of the Convention Against Chemical Weapons to decide collectively how to respond. Most important, we must urgently help end the war in Syria, starting with a ceasefire and arms embargo on all sides. Russia, Iran, and others must stop arming and funding the Syrian regime. Washington, Saudi Arabia and other U.S. allies must stop arming and funding the armed Syrian opposition. Washington may have to threaten the Saudis and Qataris that if they don’t stop, we will cancel all existing weapons contracts with them.”— Phyllis Bennis, director of the New Internationalism Project at the Institute for Policy Studies in Washington, D.C.
“Syrian civil society must decide Syria’s future. Unarmed, well-prepared peacekeepers volunteering under the aegis of groups like the Nonviolent Peace Force could help provide security for Syrian civil society groups as they work toward an end to the fighting and begin the process of rebuilding. “1) One important means of weakening the Syrian regime — at least to the point where they would be willing to engage in serious negotiations — is to encourage divisions within the ruling elite of Baath Party officials and military leaders. While bombing would just get them to close ranks, support for renewed nonviolent resistance would result in the same kinds of divisions that were beginning to appear during the nonviolent phase of the struggle in 2011. Similarly, while bombing tends to result in a rally-around-the-flag effect — particularly given the effectiveness with which the Assad regime has manipulated nationalist sentiments — nonviolent resistance in the face of repression results in far greater support for the opposition. 2) Given that a key variable in the success in popular uprisings is the degree of popular participation, support for a renewed nonviolent resistance movement would enable far greater participation from the oppressed population. The survey is still open, so you can also still vote. How do these armchair diplomats plan to persuade the Russians to stop arming Assad, and what do they propose to do when the Russians refuse to stop? Thank you for this article! We can think of no website which provides a greater exposure of the obvious philosophical and political bankruptcy of the various pro-capitalist, pro-U.S. “peace initiatives” in current circulation than yours does here. The idea that “peace” can be obtained somehow in the context of a largely capitalist world divided into nation-states competing for scarce land, raw materials and markets is a chimera. There can be no “peace” under the existing capitalist order; the United States alone has engaged in hundreds of military operations domestically and overseas since 1776; in fact it is difficult to even point to a time when “peace” reigned anywhere in the world for any significant historical period since the rise of industrial capitalism and modern imperialism in the 19th century (https://en.wikipedia.org/wiki/Timeline_of_United_States_military_operations). More to the point is our Marxist understanding of the nature of capitalism – an economic system based on greed – in which competition between capitalist nation-states for access to raw materials and markets has led already to two savage world wars, hundreds of smaller wars, and now threatens to plunge the planet into a global nuclear holocaust. It is the capitalist system itself and its mad pursuit of profits that breaks down the bonds between human beings at all levels of society; capitalism must be overthrown internationally before human society can evolve to a level where “peace” becomes the norm. Of course, as Marxists, we understand that only through workers revolution all over the world, which will overthrow the tiny minority of filthy rich capitalists – who rule this planet as if it was their own personal piggy bank – and the replacement of this greed-based capitalist system with a global egalitarian workers republic – can we hope to usher in a future for the world in which war of any kind will be literally “unthinkable” on a planet where every worker truly believes and understands the scientifically proven fact that every other human being on Earth is not an “alien” or “the enemy” but a blood relative. The first thing that would have to be done would be to get the presently involved imperial powers and their satellites to agree that Syria should no longer be a bone of contention between them. I don’t know how anyone could bring that about given that the U.S. government is one of those powers and seems to be unable to break the habit of military intervention, with the Russian, Chinese, and Iranian governments now responding in kind. 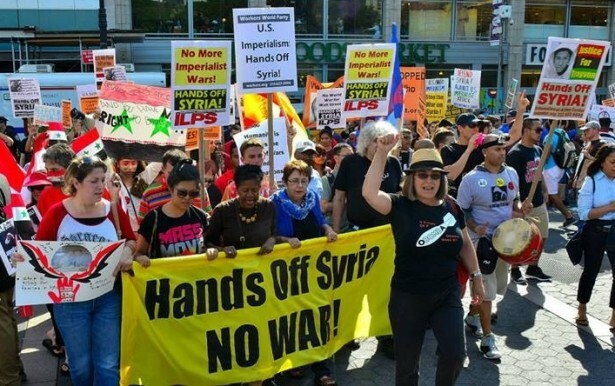 As long as a lot of hypocritical talk about peace, freedom, and democracy go on, absent an honest recognition of the power game, the truth of war, imperialism, and dictatorship will persist — in Syria and elsewhere. –people have to have water for drinking, food, and sanitation. This is not negotiable. –Turkey is part of the problem, in that the diverted about half the water from the Euphrates to promoting agriculture in Kurdistan. Given how fractitious Kurdistan is, giving that water back to Syria (their downstream neighbor) might provoke another revolt among the Kurds. One possible solution is what’s happening right now: decrease the number of people in Syria by up to 50%. At that point, even a crappy, factionalized government can provide them water. Of course, those 11 million people have to go elsewhere that does have water. Many of them are currently going to Kurdistan. I would be rather more impressed if the US took more refugees. We need more dryland farmers, and there’s a century-old tradition of settling Syrian farms in the Southwest to teach the locals how to farm a desert. Another possible solution involves building a lot of large desalination plants along the Syrian coast, as Israel has done. While this is expensive, each regional plant is cheaper than a day of all-out war, US Iraq-war style. Doing both of these (resettling refugees and building desal plants) would help make life livable again. Unfortunately, no one seems to be proposing this, at least not vocally. This is not an argument that environment trumps politics. Environmental issues set the stage, but I’m afraid this war won’t be over until there’s enough water to go around in Syria, however they get there.